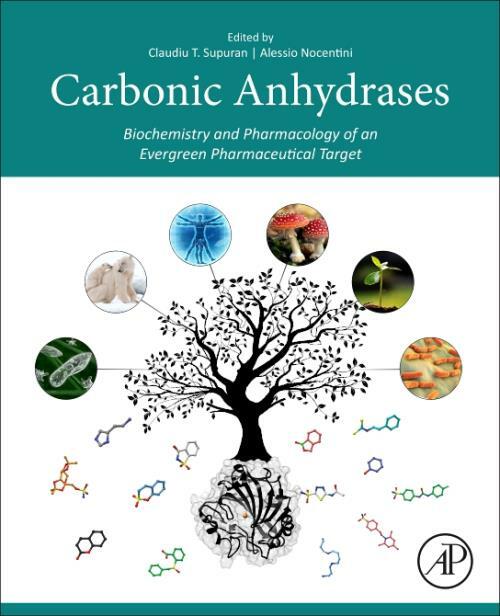 Carbonic Anhydrases: Biochemistry and Pharmacology of an Evergreen Pharmaceutical Target provides a detailed overview of CAs, spanning biochemical and structural features to pharmacology and drug-design, and also touching on the various biotechnological applications of these metalloenzymes. The book adopts a clear, step-by-step approach and introduction to this intricate and highly interdisciplinary field, first covering carbonic anhydrase classification (biochemistry and the structure of all CA classes), their role as drug targets (pharmacology and drug design of carbonic anhydrase inhibitors and activators), and the biotechnological applications of specific CA classes. A diverse range of chapters from international experts speak to carbonic anhydrase distribution, carbonic anhydrase families, human carbonic anhydrase, CA inhibitors and activators, CA zinc binders, zinc-bound nucleophile, and CA employed in the treatment of glaucoma, epilepsy, obesity, neuropathic pain, arthritis, and infectious and fungal agents, and more. Part 3: Carbonic Anhydrases as Drug Targets 8. Human Carbonic anhydrases: tissue distribution, physiological role and druggability 9. Mechanisms of action of Carbonic Anhydrase inhibitors: Zinc binders 10. Mechanisms of action of Carbonic Anhydrase inhibitors: compounds that anchor to the zinc-bound nucleophile 11. Mechanisms of action of Carbonic Anhydrase inhibitors: Compounds occluding the entrance of the active site 12. Mechanisms of action of Carbonic Anhydrase inhibitors: compounds that bind "out of the binding site and compounds with an unknown mechanism of action 13. Carbonic anhydrase inhibitors as ophthalmologic drugs for the treatment of glaucoma 14. Carbonic anhydrase inhibitors as diuretics 15. Carbonic anhydrase inhibitors for the treatment of epilepsy and obesity 16. Carbonic anhydrase inhibitors for the treatment of tumors: therapeutic, immunologic, and diagnostic tools targeting isoforms IX and XII 17. Carbonic anhydrase inhibitors for the treatment of neuropathic pain and arthritis 18. Carbonic Anhydrases from pathogens: bacterial CAs and related inhibitors as potential anti-infectives 19. Carbonic Anhydrases from pathogens: fungal CAs and related inhibitors as potential anti-fungal agents 20. Carbonic Anhydrases from pathogens: protozoan CAs and related inhibitors as potential anti-protozoal agents 21. Carbonic Anhydrase Activators and their potential in the pharmaceutical field. Claudiu T. Supuran received his BSc in chemistry from the Polytechnic University of Bucharest, Romania (1987) and PhD in chemistry at the same university in 1991. In 1990 he became assistant and then associate professor of chemistry at the University of Bucharest. He was a visiting scholar at University of Florida, Gainesville, USA, at Grifitth University, Brisbane, Australia and visiting professor at University of La Plata, Argentina. In 1995 he moved at the University of Florence, Italy, where he is currently assistant professor of pharmaceutical chemistry. His main research interests include medicinal chemistry, design of enzyme inhibitors and activators, heterocyclic chemistry, chemistry of sulfonamides, sulfamates and sulfamides, biologically active organo-element derivatives, QSAR studies, X-ray crystallography of metallo-enzymes, metal complexes with biologically active ligands (metal-based drugs), carbonic anhydrases, cyclooxygenases, serine proteases, matrix metalloproteinases, bacterial proteases, and amino acid derivatives among others. He has published more than 700 papers in these fields. Dr. Alessio Nocentini currently works at the Department of Neuroscience, University of Florence, Italy. He recently concluded his PhD thesis, which dealt with several aspects of carbonic anhydrase, spanning from drug-design, synthesis of inhibitors, and molecular modeling to biological evaluations of carbonic anhydrase modulators. He is now a post-doctoral researcher in Professor Supuran's research team.